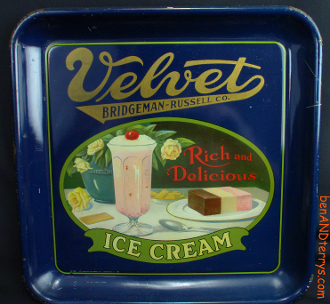 Velvet Rich and Delicious Ice Cream Serving Tray Bridgeman-Russell Co. Nice tray with excellent graphics. Tray marked ©1925 The American Art Works, Inc., Coshocton O. 151 in lower left corner. Tray measures 13 1/4" x 13 1/4". Tray has some edge wear, chipping, scratches and and handling marks. Vibrant colors. Tray displays nicely.